Kissimmee, FL-May 3, 2017- USSSA continues to move forward with upgrades to USSSA Space Coast Stadium. 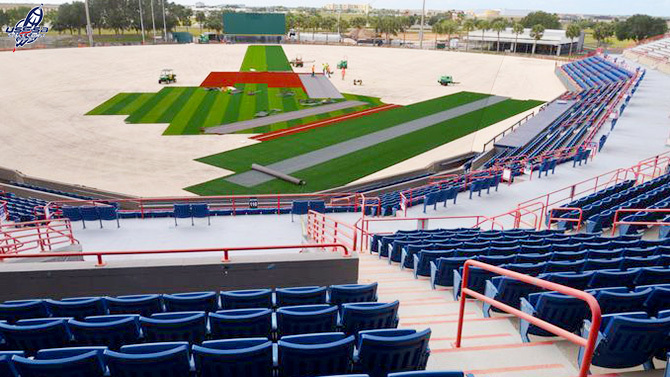 This Wednesday, workers began installation of the Pro Grass artificial turf on the main field at USSSA Space Coast Stadium. When all is said and done 1.4 million square footage of Pro Grass will cover all 15 fields in the new complex. The first six fields, including the main stadium are expected for completion by mid-July of this year while the remaining nine fields are expected to be completed later this fall. All fields will sport the latest Musco lighting technology as well as several media facilities with the latest broadcasting capabilities for all youth and professional games. USSSA National Headquarters will be moving to Viera, FL next week Tuesday, May 9th in preparation for the 2017 summer. One of the first events hosted at USSSA Space Coast Stadium will feature a National Pro Fastpitch (NPF) match-up between the USSSA Pride against the Akron Racers on June 8th, it will be the USSSA Pride’s first home series match-up at the new complex. For more information visit USSSA.com. The United States Specialty Sports Association (USSSA) is a non-profit sports organization that serves as the governing body for 13 amateur sports across the United States, Puerto Rico, and Canada. Originally founded in 1968 as the United States Slow-pitch Softball Association, the USSSA has flourished for over 50 years as a hub for youth and amateur athletics. With over 3.5 million members, the USSSA is one of the largest amateur sports organizations in North America.